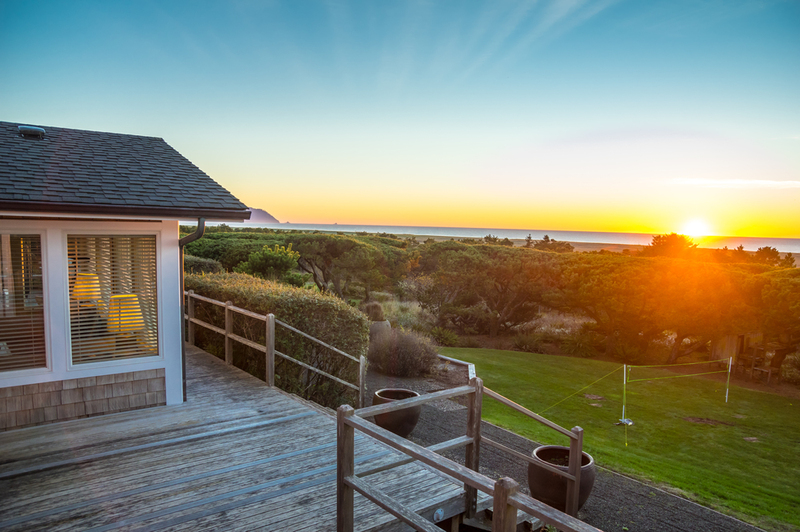 Experience the best of Gearhart and Seaside, Oregon — gorgeous vacation rental homes with ocean and river views. Experience the serenity of beach living. Our captivating and elegant Ocean Breeze home offers a spacious home for up to 16 guests. Double-sided gas fireplace in living room and kitchen. Splendid panoramic views of the Necanicum River, the city of Seaside, Tillamook Head, and the Pacific Ocean from the living room, dining room, kitchen, master bedroom and deck off dining room. Sunset Bliss is an immaculate home that sits atop a sand dune in the prestigious neighborhood of Surf Pines on the North Coast of Oregon. Views of the Pacific Ocean, Tillamook Head, and wildlife passing by can be seen throughout the home. The wonderful, open, and spacious design of Sunset Bliss welcomes your entire family. Sleeps 13. Enjoy a private, spacious beach retreat with room for the entire family and pets at Beachy Pine in Seaside. Private front and back yard. Sleeps 12. Exterior fire pit for those nights you want to sit around a fire and relax with family and friends. Located in the heart of Seaside, Oregon. Gearhart Getaway is a privately owned home and is located on the south end of Gearhart, just steps to the desirable Little Beach and walking paths, where the Necanicum River meets the Pacific Ocean with a beautiful view of majestic Tillamook Head. Sleeps 10. This comfy and simplistic 1920's beach cottage is perfect for families that want to create wonderful memories at the beach. Located just 2 blocks from the promenade and beaches of Seaside, right next door to the U-Street Pub, and around the corner from Ken's Market this simple and cozy cottage will be a hit with extras like a hot tub and ping-pong table to entertain you. Sleeps 8. © Best Beach Rentals LLC | All rights reserved.